For the last two months (May 2012 – June 2012) I have been staying in the village of Yanoun in the West Bank. It is with great sadness that I share this latest report coming from EAPPI. On Saturday, 7 July 2012 at approximately 3:00PM (GMT+2) Israeli settlers from the illegal settlement of Itamar approached three Palestinian farmers in Yanoun who were harvesting their wheat and grazing their sheep. The settlers were armed with knives and killed three of the farmers’ sheep. A clash then ensued, in which the settlers and farmers began throwing stones at one-another. Yanoun is a small village in Area C of the West Bank, just southeast of Nablus. It has about 65 inhabitants who are dependent upon farming and animal husbandry as their main source of livelihood. The village is surrounded by the illegal Israeli settlement of Itamar and since 1996 the residents of Yanoun have consistently experienced settler harassment and violence, as well as property damage and confiscation. In October of 2002 the settlers of Itimar forcibly evacuated Yanoun of its inhabitants. International humanitarian agencies and Israeli human rights organizations then came to Yanoun to provide a protective presence with the aim of facilitating the return of the community. These left Yanoun within weeks of the community’s return; however, the Ecumenical Accompaniment Programme in Palestine and Israel (EAPPI) has remained in Yanoun since October 2002. Based in Yanoun Ecumenical Accompaniers (EAs) provide a protective presence, monitor, and report on human rights violations in the community, as well as the entire Nablus Governorate and Jordan Valley. · Forward this article to your networks. · Inform your representative in parliament about what has happened in Yanoun. · Update news/media agencies (radio, TV & print) in your countries about this incident. On Saturday, 7 July 2012 at approximately 3:00PM (GMT+2)Israeli settlers from the illegal settlement of Itamar approached three Palestinian farmers in Yanoun who were harvesting their wheat and grazing their sheep. The settlers were armed with knives and killed three of the farmers’sheep. · Jawdat Bani Jaber (Hospitalized): was beaten and stabbed multiple times by settlers,then shot in the face and foot by Israeli soldiers. He was then handcuffed by Israeli soldiers and attacked again by the settlers while the soldiers pursued other Palestinian farmers. After being attacked, the military did not allow a present ambulance take him to a hospital or care for him for approximately 3-hours. Though the settlers were the attackers in this clash, the Israeli Military and Police provided them with protection to carry out the attack. 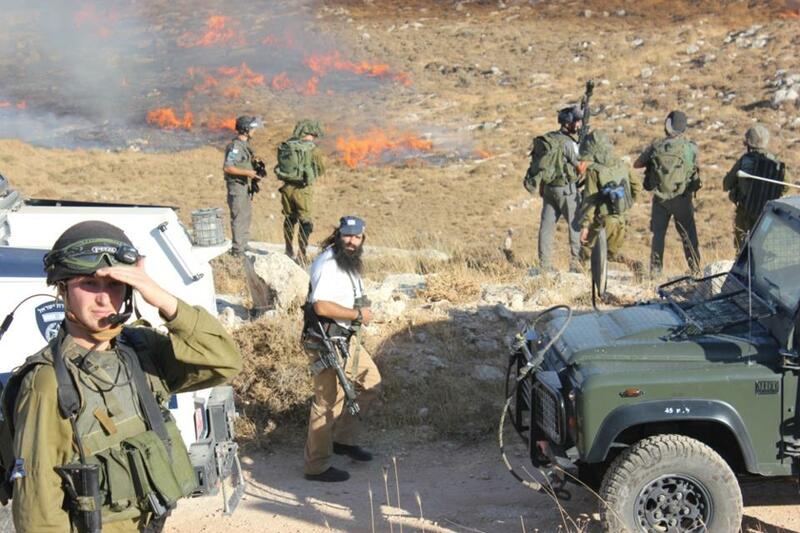 The soldiers and officers attacked Palestinians who defended themselves from the settlers, did not attempt to put out the fires that blazed throughPalestinians’ fields – nor let anyone else do so, and delayed medical attention for the victims of the attack.